Cordancia Chamber Orchestra in concert features music from Eastern Europe, including works by Leó Weiner (Hungary), Bohuslav Jan Martinů (Czechoslovakia) and Alexandre Tansman (Poland). 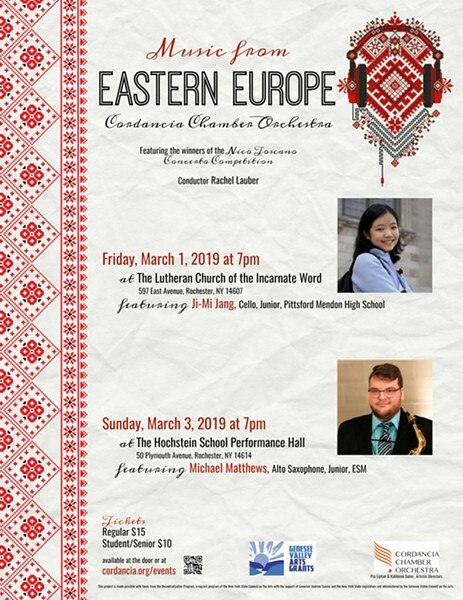 Michael Matthews, junior at the Eastman School and a student of Chien-Kwan Lin, College Level Winner of the Nico Toscano Concerto Competition, performs Glazunov’s Saxophone Concerto. Conductor: Rachel Lauber. Artistic Directors: Pia Liptak and Kathleen Suher.